Dubai, UAE, September 02, 2018: Panasonic is proud to announce the launch in the Middle East of the LUMIX LX100 II with a large, 4/3-inch High Sensitivity MOS Sensor for the 7th generation model of Panasonic’s world-renowned LX high-end compact camera series. The LUMIX LX100 II boasts a total 21.77-megapixel sensor achieving an effective 17.0 megapixels in 4:3 aspect ratio. This new high-resolution MOS Sensor maintains an excellent S/N ratio, allowing the device to capture even the finest details of the subject. Likewise, the high pixel count ensures sufficient image resolution for photos even in 3:2 and 16:9 aspect ratios. Together with Panasonic's latest Venus Engine image processor, it achieves superb image quality with natural, true-to-life description. 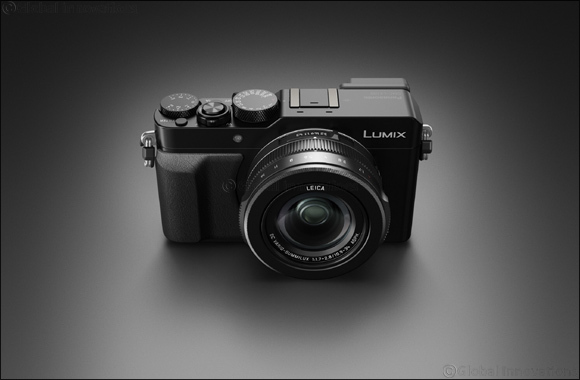 The Panasonic LX100 II is built with a Leica DC Vario-Summilux lens, offering a 24 – 75mm (35mm equivalent) focal length and fast aperture of f/1.7 – f/2.8 on a nine-blade aperture, which can focus as close as 3cm (1.2 inches) at wide angle. The lens also features Power O.I.S. image stabilization. “The LUMIX LX100 II is a perfect second camera for professional photographers as well as photography hobbyists, with its sophisticated technology that allows you to express your creativity. It has one of the largest sensors – 4/3 – you can get on a compact camera. Panasonic also retained its well-loved and standout features, its super bright Leica lens in a stylish, neo-classical camera design,” commented Hitesh Ojha, Deputy General Manager – Audio Video Department, PMMAF. The LX100 II’s new 4/3-type (inch) total 21.77-megapixel High Sensitivity MOS Sensor allows users to acquire even higher resolution than its predecessor, the LX100. It also has the ability to shoot at multiple aspect ratios without changing the diagonal field of view. The high pixel count ensures sufficient image resolution for photos in 4:3, 3:2, 1:1 and 16:9. This new high-resolution MOS Sensor maintains an excellent S/N ratio, resulting in a dramatic reduction of noise even when shooting at a high ISO setting at max. ISO 25600. The Venus Engine, meanwhile, renders vibrant, true-to-life high-quality images with excellent resolution, high contrast and impressive color reproduction. The combination of the High Sensitivity MOS Sensor and the Venus Engine achieves stunning picture quality that rivals that of D-SLRs. The LUMIX LX100 II incorporates LEICA DC VARIO-SUMMILUX lens system (F1.7-F2.8) providing 3.1x optical zoom (35mm camera equivalent: 24-75mm) with POWER O.I.S. (Optical Image Stabilizer). Comprising 11 elements in 8 groups, including 2 ED lenses and 5 aspherical lenses with 8 aspherical surfaces, this advanced lens unit achieves high contrast and resolution. The lens unit boasts F2.8 high speed even at the tele-end, allowing handheld shooting in low-lit situations or adding beautifully defocused background on both photo and video. With such powerful lens, stunning macro shots can be shot with minimum working distance of 3cm (wide) and 30 cm (tele) despite its large-sized sensor. It also complies with maximum 1/4000(mechanical) and 1/16000(electronic) high speed shutter speed. The camera has a high-resolution (2764k-dot) Live View Finder, offering a 100% field of view and excellent magnification (0.7x, 35mm equivalent). The new 3.0-type (inch) large rear monitor increases its resolution to approximately 1240K-dot, enabling touch control. Direct operation is made possible, thanks to dedicated rings and dials including an aperture ring, control ring, shutter speed dial or exposure compensation dial. The device achieves high speed AF of approximately 0.10 sec* and high-speed burst shooting at 11 fps (AFS) / 5.5 fps (AFC) to capture fast moving subjects just in-focus. It also integrates Starlight AF which allows users to shoot a star in the sky at night with auto focus. This can be achieved by accurate calculation of contrast value in a smaller AF zone. Panasonic’s advanced 4K technology is evident in the camera. The 4K PHOTO function takes advantage of 4K video recording to allow you to shoot at up to 30fps*1 and extract the perfect moment as 8-megapixel stills directly in the camera. New innovations include: Auto Marking function for choosing the best shot out of hundreds of frames, and Sequence Composition, the merging of various frames to create a special effect. Additionally, Post Focus and Focus Stacking functions are new welcome features, as well as Light Composition mode, which can be used to create dramatic firework or night scenery shots with ease. Users are promised with endless creative possibilities with the new L. Monochrome D mode and grain effect features. L.Monochrome D has been added to the monochrome Picture Styles options, which creates dynamic black and white images with emphasized highlights and shadows, all while preserving details. Choose from different grain strengths to add a filmic quality to your monochrome images. The LUMIX LX100 II integrates Bluetooth® and Wi-Fi® connectivity to offer a more flexible shooting experience and instant image sharing with easy operation. Equipped with a Micro-B USB 2.0 port, the camera’s battery can be easily recharged either via AC or USB anytime, anywhere. The LUMIX LX100 II will be available in the UAE at Al Futtaim Panatech store from end of November 2018 onwards at AED 4,049 (price exclusive of VAT). It will also be released across other GCC markets soon after its UAE debut.